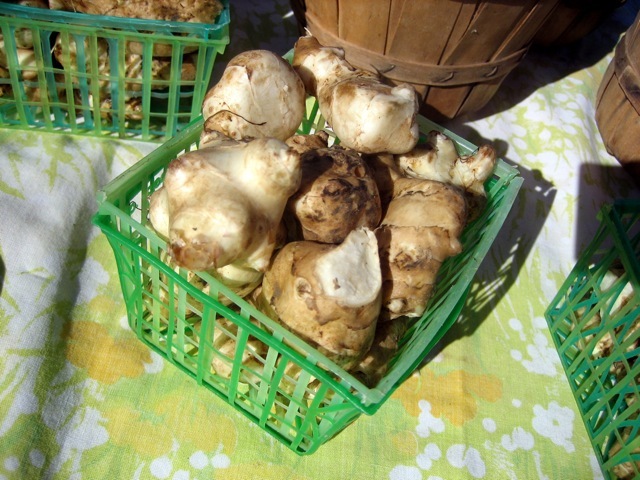 The Jerusalem Artichoke got the “most interesting vegetable” award (at least in my book) at the Boulder Farmers’ Market last week. I’d seen them last fall. I was even given one as a sample by a generous farmer who noticed me hovering around them with a look of befuddlement. But alas, I tucked it into one of the many pockets of my purse, where it was left to a fate of dehydration and neglect. Cleaning out my purse a few weeks later, it no longer resembled its former self. The markets were done for the season, and my Jerusalem Artichoke aspirations were placed on hold. At the market this week, I approached a crop of Jerusalem Artichokes and hovered again, maintaining enough distance to keep the farmer from engaging with me. I listened to the comments of passers by. “Oh, it’s ginger” one woman said with confidence when a friend asked her what it was. Another said it was a sunchoke. Finally, I asked the farmer who told me it was a Jerusalem Artichoke. It’s the root of a flower that is related to a sunflower, and has nothing to do whatsoever with an artichoke. These Jerusalem Arthickokes had been left in the ground over the winter, and dug up for last weeks market. Read more at The Weekly Veggie Thanks for visiting!